Nyonya use to be one of my favourite cheap-eats in London. Great food is always hard to pass up, and when combined with cheap prices, makes it even harder to beat. As a bit of an ex-regular, I couldn’t help but lament Nyonya’s closing. I suspect the exorbitant Notting Hill rental prices must have had something to do with it. But the people behind it came back to open up Sedap (which means delicious in Malayan) in Old Street about a year ago. The location is far less glamorous than Notting Hill, but the menu prices have remained cheap. The downside is that it’s harder for me to get to and I no longer call myself a regular. So this was my first visit since it opened up as Sedap, and I must say, it was definitely worth the wait. 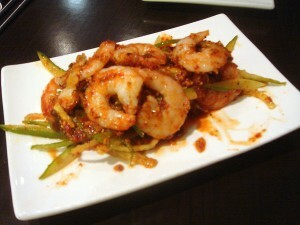 We started with kerabu prawns (£6.50), a fresh, crunchy salad of prawns and cucumber finished with a kerabu dressing. Loving the combination of sweet, sour and salty flavours that are a hallmark of a kerabu, we polished this off in minutes. Finely chopped peanuts and black fungus added crunchiness to the salad, and the chilli gave it a nice little kick. Malaysian blanchan chicken (£6), a dish of bite-sized pieces of chicken coated in prawn paste and deep fried, came out piping hot. 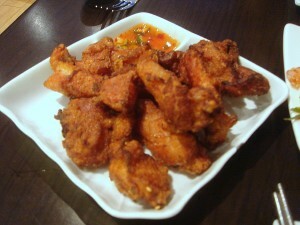 The chicken was meltingly tender and the prawn paste was superbly crunchy. It was accompanied by a lovely sweet chilli sauce which worked well with the slight saltiness of the prawn paste coating. A Penang char kray teow was outstandingly good (£7.25). A dish of tender flat rice noodles stir fried with prawns, it was as authentic as if it had come from a good hawker stand in Kuala Lumpur. It also came with lots of other lovely goodness such as Chinese sausage, egg, fish cake and bean sprouts. Garlic, soy sauce, chives and chilli paste helped round off the dish and to provide lots of flavour. Nasi lemak (£7.60), a rice dish served with chicken curry, deep fried mackerel with sambal sauce, half a boiled egg and peanuts was decidedly tasty. 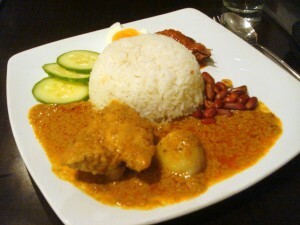 The curry was creamy, the mackerel crispy, and the rice, cooked with coconut and lemongrass, was extremely fragrant. This dish was served at room temperature. For dessert, we had nyonya kuih (£2), traditional Malaysian steamed cakes made with glutinous rice flour and coconut. The rice flour produces a slightly starchy, dense texture. 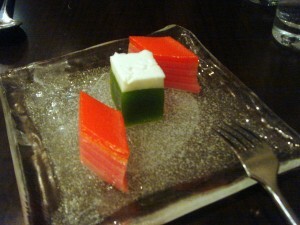 There are three pieces in the serving, one of which was flavoured as pandan and coconut. All were delicious. Another item worth trying at the restaurant is teh tarik (2.50), a pulled tea made with condensed milk. This is basically a tea which has been continuously poured back and forth from one cup to another. There’s a delicious richness to the tea which is quite unique. The décor is simple, as befits a restaurant serving street food. Service was friendly, and in the Asian tradition, the food comes out as and when it’s ready. Interestingly there are more dim sum items at Sedap than I remember there being at Nyonya (the restaurant markets itself as serving both Malaysian and Chinese food). Price range: Three courses about £15. Excludes drinks and service. Oh, I really have to get myself over there on day! The food looks excellent! do go! 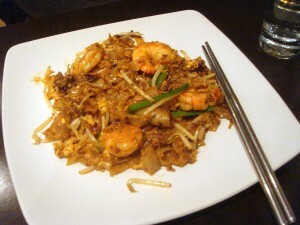 I definitely recommend the char kway teow. Yum! Ohhh this looks good! I am starving, want to go there now…! I echo Krista’s love of Sedap. It’s much better than Rasa Sayang (and even better than Nyonya ever was, I think). I hadn’t realized that Sedap now serves dim sum, though. How odd. As for Rasa Sayang, I think it’s rather overrated. Yes Sedap is much better than Rasa Sayang. Best CKT in London so far for me. I have to agree that the CKT really is something else. My mouth is still watering over it!